Grease a large baking dish with oil. Spread half of the tamal dough or masa in a single layer over the bottom of the baking dish. Set aside 3/4 cup of salsa verde and combine the rest with the shredded chicken. Spread the chicken and salsa verde mix on top of the masa. Cover with the rest of the masa in a second layer. Cover with aluminum foil and place in the oven for an hour. Remove from the oven. Carefully remove the aluminum foil and spread on the remaining 3/4 cup of salsa verde. Top with the cream and cheese. Place back in the oven, uncovered, for 10 more minutes, or until the cheese completely melts and begins to brown along the edges. Serve hot, cut into squares. If you use prepared masa, how much in lbs.? Oh! Not sure what i did wrong! My tamal dough came out dense and dry, but the chicken filling was delicious! Oh I’m glad you enjoyed the filling, Marie! Next time, try adding more chicken broth and lard, and whip the masa longer until it is super fluffy and puffy. I love salsa verse!! So far I have only used it with enchiladas. I also love poblana peppers and I am one American that uses them exclusively instead of green bell peppers. I never tried making tamales, but this recipe sounds like a good place to start. Somehow I think a couple of poblanos will find their way into my product of pollo salsa verde tamals. Oh it’s a great place to start, Jeff! I hope you love the tamales…and adding poblanos is a great idea. I love tamales and they are hard to find in Vancouver. After watching your show, you gave me the incentive to make my own. This casserole is so delicious I’ve already made it 3 times. My husband enjoys eating it too. Just wondering if I could omit the lard or oil when making the dough as some of my friends are watching their fat intake. What is the purpose of adding lard? I’m so glad you and your husband enjoy the casserole, Lily! The tamales need some kind of fat to make the masa puff and be fluffy. The lard can be substituted with seasoned oil or even coconut oil. You can also reduce the fat a little but it will have different results. 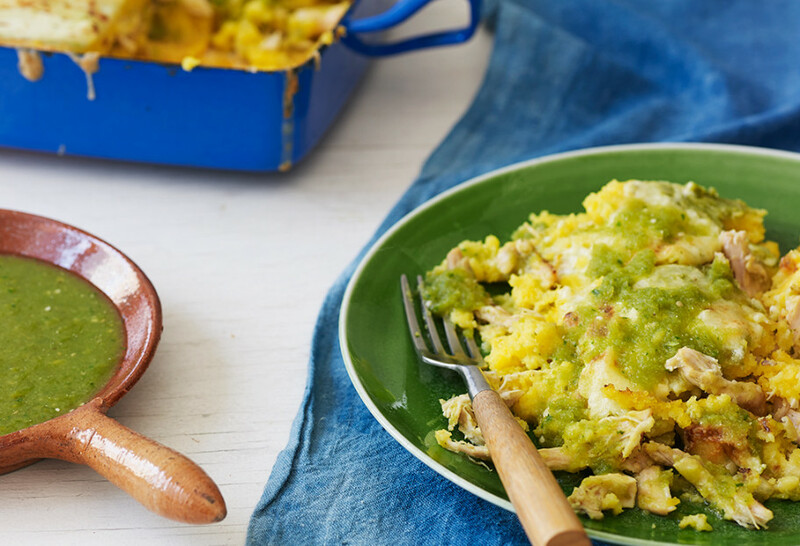 hola pati, i plan to make this tamal casserole for my weekend trip with my girlfriends. i was wondering if lining the casserole dish with corn husk and a layer on top then bake the casserole in a water bath then remove from oven the last 15-20 mins to add cream and cheese. do you think it would work out ok? kinda like one big tamale! i would reheat it in a water bath too! Can the tamal casserole be made ahead of time and baked later? Or baked and reheated later? I would make it ahead of time and bake it later…. but if you bake it and have leftovers, they can be reheated too! (Just cover it when you reheat it so it doesn’t dry out). Hello! I wanted to share what I’ve tried with this as I’m very much a make-ahead, freeze ahead cook. I made and froze separately the green salsa, chicken, and masa ( I spread the masa out in a rectangle on a lined cookie sheet, froze solid, then wrapped it well. It’s a little tricky to transfer to the casserole once thawed, but any places where you have to patch it will be covered by sour cream and cheese : ) ). I later thawed all the components, warmed the chicken in the sauce, assembled, and baked. I think the masa is a tiny bit softer this way, but it’s still delicious. My brother’s family (visiting from California) LOVED it, and a day or two later everyone enjoyed the reheated leftovers as well. Not quite the same texture as the first day, but still good. I’ve also frozen squares of leftover casserole and reheated them for quick work-day lunches. I just love that I can have a wonderful “real” tamale taste with the ease of cooking a casserole! Thank you for sharing, Emily! And I’m so happy everyone loved the casserole. Love this dish! I kept mixing the masa until it floated in the glass. I used crisco and butter. Next time I am hunting for the lard. Thank you for such a wonderful show. And this delicious dish tamales casserole. I LOVE tamales, and I can’t wait to make this. Do you have any suggestions for a vegetable/vegetarian filling for this? I am new to Mexican cooking, and I am not sure what combination would taste good. Zucchini and tomatoes? Thank you. Oh so many great veggies would go with these…choose your favorite and enjoy Deborah! does the cooking time vary depending the cooking dish ? i have had bad experiences with glass casserole dishes! by the way me and my 3 year old daughter love your show! Any large baking dish will work. Say hello to your daughter for me! Hola Pati! I came across this recipe in your cookbook, “Mexican Today”. I’ve never had success with recipes calling for masa, it’s always so heavy and too dense to enjoy. I followed your instructions, alternating the broth and masa harina, along with beating for a good 10-15 minutes, and I was so proud of the end result! Light, fluffy, tender tamal perfection; I couldn’t believe I made this. I can’t wait to experiment with different fillings. This is a great dish for warming the incredibly cold nights we are enduring here in the Northeast. Many thanks! That is so awesome!!! Thank YOU Rayna! Oh no! But I’m sure it will be better next time :). Thank you so much Aimee!!! This is so good! Reheats beautifully; my husband and I are eating leftovers tonight! Oh ny goodness! The casserole is beyond delicious! And I’ll be making both it and the salsa verde again! My husband and I are enjoying this for dinner as I write – so so so good! Pati, this casserole was so darn good my family ate every bit of it. I tried it with the chicken of course but I also made it with a beef roast and red chili. DELICIOUS!!! My only problem was that it stuck to the bottom of the baking dish so I’m going to try using parchment paper. Can’t wait to eat this again. So glad you made the casserole your own and enjoyed it! My Mexican mother in law and I called each other right away during the marathon and couldn’t believe what we were seeing. This looks amazing! We can’t wait to try this near Christmas! Yes, let me know, Jason! Hello to your wife! I made the Chicken in Salsa Verde Tamal Casserole tonight and had a problem making the tamal. I used the seasoned oil but could not get it to the white and spongy stage. Where did I go wrong? The finished dish was delicious. Hi Pam, the dough gets less spongy when using the seasoned oil rather than the lard or vegetable shortening. So no worries, specially if you loved the dish! I am so grateful to you for sharing this wonderful idea with us! I am going to make this for my darling Mama’s birthday dinner. She loves tamales, and loves to help make the dinner, but can’t use a steamer because she’s in a wheelchair and can’t reach into the pot! SO we are going to make it this way and have a wonderful time. You are a gem, can’t wait! This warms my heart, Paul. Good luck! Looking at this recipe brought to mind another recipe that my mom used to make. I never paid attention how she made it and after passing, I’ve craved it. Just recently a family member knew the recipe I described. She said it is called, “Huevo perdido”. I tried making it, but I think I add too much masa. Have you heard of it or have this recipe to share? Hi Pati– vamos a la Ciudad de Mexico el 28 de esta mes. On one of your shows, you visited a tamal factory in el D.F. No puedo encontrar el programa… como se llama el lugar? Gracias! Vamos tambien al Restaurante Cardenal! Que increible! El Cardenal es de mis restaurantes favoritos! La tamalería se llama Emporio y también tiene un restaurante. Que disfruten! Patty como más o menos cuantas libras de masa usastes para el casserole? Hola, I am so excited to make your tamale casserole for my mother-in-law’s birthday! The only problem is I don’t know what to serve with it, if anything. What do you suggest? Saw the show today.instantly craved my much missed tamales! Had everything on hand to make the casserole, so that’s what we had for dinner! Mmm que rico! Como siempre! Gracias por toda las recetas tan super deliciosas!!!!! Hi, Pati! One of my favorite things in this world are green corn tamales. Do I just make the masa sweeter and put strips of roasted chilies in the middle of the casserole? Love your show as always. Hola Kim, Yes, you could add roasted poblano chile strips and use the masa from the Uchepos recipe (http://patijinich.com/2015/04/sweet-corn-tamales/) to make it more like green corn tamales. pati we made your tamales and green rice it was so good thank you from Texas.soooo great an easy. Great to hear! Send my best to Texas! Pati, I really dislike cilantro. I can handle dried coriander or seeds, just not the leafy stuff. What can I substitute in the Salsa Verde recipe? You can either just skip the cilantro, or substitute with another green herb of your choice, like chives or tarragon or even mint! Pati, how about a show using New Mexico green chile, I think this has such a unique flavor, smell, and heat. I love using that chile from Hatch New Mexico. I know you can have a great show issue no that with the skills and creativity you have. Love the tamal recipe. We live in ABQ and use NM green chile came out great! Thank you for making it!! Watching your brilliant program on tamales, lovely stuff. We are going to try your recipes. Hola George, The dishes are made by Le Creuset! Thank you so much for watching & I hope you both enjoy the tamales.